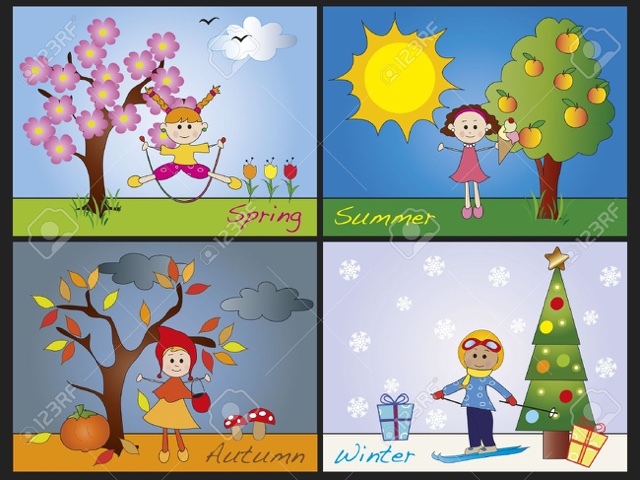 Seasons – Who decides when and how should they come? Hello Friends, Howah Howah….that’s how we should all greet each other and it means how r you? Isn’t it great…me and my daddy invented this phrase after seeing TAYO videos. That story later on, as I want to tell you all about my experience with seasons. My teacher aunty started teaching seasons this month in my school (Babaji Vidhyashram). I used to think till date another kid like me used to open the tap up in the skies and rain would come. As I always play with the water taps in the bathroom. My mummy told me that thunder sound is due to the fact that Krishna and Arjuna are playing with laptops and doing cloud computing. So I always wanted to go up and play with that mystic boy who opens taps or with Krishna and Arjuna as cloud computing definitely sounds interesting isn’t it? But my teacher confused me a lot saying how the rain would come and all that…I expected water to come from skies during the rain play in school and another aunty (my mommy friend only) threw water in a mug at me and called it rain….how annoying it would be and so silly isn’t it? These teachers sure think that we kids don’t know anything. That’s why I cried in the school you know? We kids know pretty much that seasons happen because either Govinda or Krishna makes the magic and I want to learn that technique from them, so that I can have snow in chennai and then it would be so cool to spend time in the snow and run when snow is falling isn’t it? I think I should ask Govinda for sure on that isn’t it? But somehow, I keep forgetting to ask these questions as getting Govinda is tough due to the festive season and so during the limited time we get, we need to play a lot isn’t it? By the way, my basic doubt remains as it is. Why do we need four different seasons, why can’t they all get rolled into one. We can have rain, snow, summer heat all in one isn’t it? Anyway, we do have long days of 24 hours each nah…I am just learning to read time you know? And it’s fun to read time…I like to read from right to left and my mommy says we need to read from left to right. So tell me guys,who decides which way we should read? I think based on our mood we should decide which way to read…what do you say? Previous Post Thinking McQueen – guess who is it? Next Post Bath, Bath & Bath – Who invented this headache?